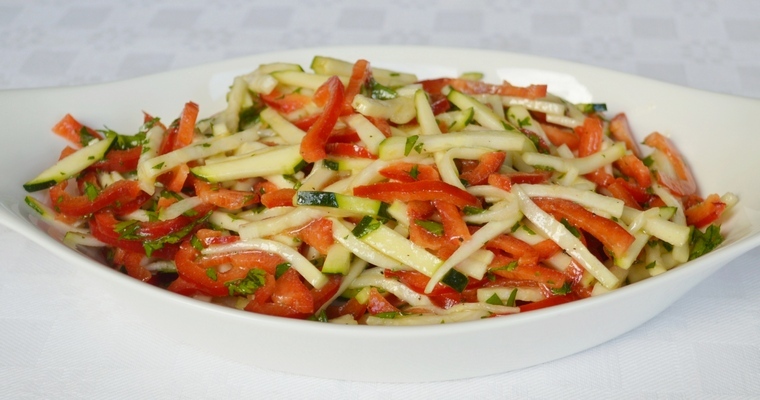 Refreshing raw vegetable salad. Courgettes and sweet peppers are tossed with parsley and a simple French dressing of olive oil, vinegar and Dijon mustard. This simple raw vegetable assembly goes well with chicken and ground meat dishes like meatballs and burgers. It can be made in advance, but is really at its best when freshly made. After several hours, the salad dressing emulsion will break down, and water will be drawn out of the vegetables. This results in diluted flavours, and a softer texture with less of a satisfying crunch from the pepper. As courgettes are cylindrical, the sides need to be squared off before they can be chopped into even matchsticks (a julienne cut). Cut off the ends of the courgettes and discard. Chop into thumb-sized sections. Stand a section upright. Cut down to slice off the rounded side. Turn the courgette 90° and repeat until all four sides have been removed. Slice lengthways into 1/4 inch slices. Stack several slices cut-side up, and slice lengthways again. Repeat until all sections have been chopped into matchsticks. As bell peppers narrow at the bottom and dimple at the top, cut off the top and bottom to create a uniform band. Cut down a membrane, from top to bottom. Open up the pepper and lay it out flat. Cut out the membranes. Chop into 4-6 sections. If it is a long pepper, chop the sections in half lengthways. Stack several sections and slice into 1/4 inch slices. (Alternatively, you can use a food processor to julienne the vegetables). Combine all the dressing ingredients in a jam jar, and shake vigorously until emulsified (the dressing will thicken when the oil becomes incorporated into the vinegar). Combine the julienned vegetables and parsley in a bowl. Pour over the salad dressing. Toss until evenly coated. Best eaten within a few hours.